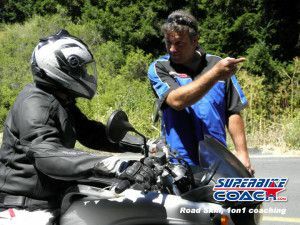 Your Superbike-Coach Road Skill 1on1 starts at 11:30am to an estimated end time of about 3:30pm (5pm if you also booked the Setup Course). You will learn useful drills out of Racing and tons of information on a designated parking lot. Part two is on winding roads and your coach rides all the time along with you. He leads and shows you the lines through the turns. The complete course covers proper braking, counter steering, balance, efficient shifting, and how to use physical aspects to your advantage. The training is very effective and will increase your confidence, awareness of road and environment conditions, and personal and bike control. Tons of MotoGP riding techniques are waiting for you. Individual coaching gives you 100% of Coach’s focus. You are 1-on-1 with a highly experienced Coach , an ex-Professional racer who coached nearly 5500 students in his career. Coach Can gives you tons of tricks from his racing experience to give you more control over your bike, which gives you more resources for priorities and enables you able to make faster and more efficient decisions. Coach Can will help you to identify and remove your bad habits, and personalizes training to fit the riders actual skill level.